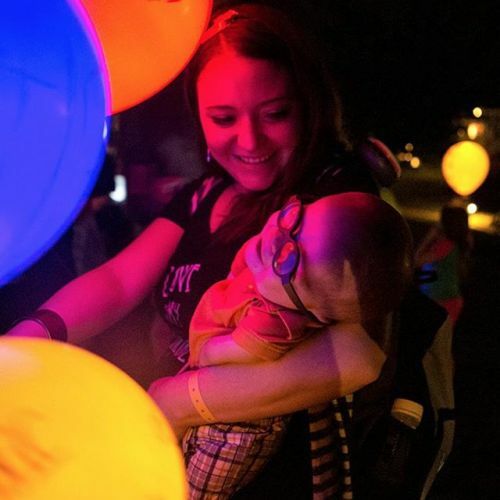 “Hannah Peters, 23, with her 16-month-old son Jude before an annual balloon release at a conference for families of children with rhizomelic chondrodysplasia punctata, or RCDP. The disease — which is thought to affect fewer than 100 children worldwide, making it one of the rarest of rare diseases — is a painful form of dwarfism, usually accompanied by severe intellectual disability and respiratory problems. There is no cure, and children rarely survive into adolescence. But at this year’s conference, in Alabama, a biotech executive from Canada discussed a potential treatment being developed by his company and the possibility that the children could be part of a clinical trial next year. “You don’t want to get your hopes up because — what if? What if it doesn’t happen? What if it doesn’t work out?” said Hannah. “But it was the only bit of hope that we had received since Jude was born.” Photo by @ilanapl. #hopeforRCDP” By nytimes on Instagram.